1. George Lillard. George Lillard was born in Virginia. While the exact date of his birth is unknown, it is believed he was born sometime around 1830. George Lillard married a young lady named Ruth, maiden name unknown, who was also born in Virginia, about 1835. Not very much is known about George Lillard or Ruth Lillard, other than they were African Americans living and working in agriculture in Tennessee about 1870. Five years after the end of the American Civil War, the 1870 U. S. Census shows George Lillard (age 40 years) residing in District 11, Rutherford, Tennessee (Post Office: Murfreesboro, TN). Residing along with him were Ruth Lillard, his wife (age 35), James Lillard (19), Martha Lillard (14), David Lillard (12), Eden Lillard (7), and William Lillard (1). Rev. James Henry Lillard and his wife, Nina Mann (mulatto), about 1890. 2. James Henry Lillard. James Henry Lillard, son of George and Ruth Lillard, was born in Virginia in December of 1844, according to the 1900 U. S. Census. His 1908 death certificate from Campbell County, TN shows James Henry Lillard's place of birth as Lynchburg, VA. In 1887, James Henry Lillard married Nina D. Mann (mulatto, b. 1869) in Franklin County, Tennessee. Nina D. Mann was the daughter of William Mann, a Baptist minister (b. 1843, Tennessee) and Sally (Embrey) Mann (b. 1852, Tennessee). William Mann and Sally (Embrey) Mann had six children, Nina, Emma, Lula, Horace, Howard, and Russell Mann. Rev. James Henry Lillard was a preacher of the Gospel. He and his wife, Nina (Mann) Lillard, had eight children: Flossie Lillard, Osker (Oscar) Lillard (b. 1888), Lassie Lillard (b. 1889), Bertha Lillard (b. 1892), Annie May Lillard (b. 1893), Mable Lillard (b. 1895), Rosa Lillard (b. 1898), and Horace R. Lillard (b. 1900). Horace R. Lillard, Sr., second from left, circa 1925. 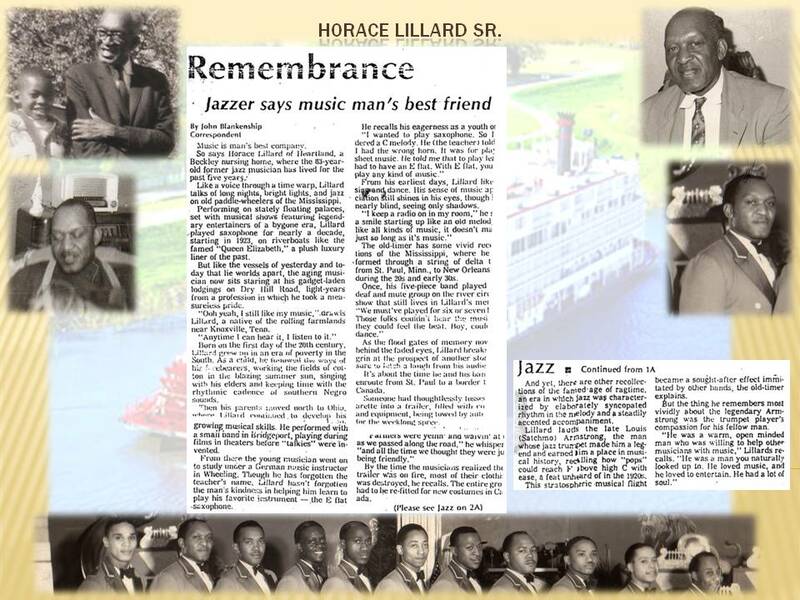 Horace R. Lillard, Sr. was a jazz orchestra leader and musician who played on the great riverboats that sailed the Mississippi River during the 1920's and 30's. This era saw the emergence of the extraordinary big bands of such musical giants as Count Basie, Cab Calloway, Duke Ellington, Lionel Hampton, Fletcher Henderson, Earl 'Fatha' Hines, Joe 'King' Oliver, and Paul Whiteman. Beginning in 1923, Horace R. Lillard, Sr. toured and performed for over a decade on those Mississippi riverboats, stately floating palaces, like the famed, luxury boat the 'Queen Elizabeth', a virtual Showboat, set with spectacular musical shows featuring such legendary artists as Louis Armstrong. Horace R. Lillard, Sr. married Aletha Randall, a church organist (b. 1905 in Martin's Ferry, Ohio), and daughter of William M. Randall (b. 1868, Indiana), a preacher, and Anna Randall (b. 1874, Ohio). William M. Randall and Anna Randall had five children, Aletha, Percy, Kenneth, Esther, and Florence A. M. Randall. Horace R. Lillard, Sr. and Aletha (Randall) Lillard had a son, Horace R. Lillard, Jr. (b. 1925 in Martin's Ferry, Ohio). After the untimely passing of Aletha (Randall) Lillard, Horace R. Lillard, Sr. moved to Beckley, West Virginia, where he married Hazel Mosley, a school teacher, (b. 1897, in West Virginia), and daughter of Archie Mosley (b. 1880). A formally trained musician, Horace R. Lillard, Sr. was a jazz orchestra leader, and professional musician who played several reed instruments. Playing the alto saxophone was his specialty, at which he greatly excelled. Starting in 1923, Lillard began touring with the premier jazz orchestras of the day on the stately riverboats that sailed up and down the mighty Mississippi River. This was the period of the American cultural movement known as the Harlem Renaissance, of which Lillard was a part. So superb was his talent that Lillard was recruited to perform with and lead bands on the majestic riverboats, which were then in their Jazz Age heyday. This era was richly described by writers of the day, including F. Scott Fitzgerald in his classic American novel, The Great Gatsby. In later years, in addition to being a very accomplished and popular musician, Horace R. Lillard, Sr. became a successful entrepreneur, who owned a grocery store (Broadway Cash Grocery), a dance hall, and a popular skating rink in the East Park community of Beckley, West Virginia. Horace R. Lillard, Sr., Lillard Family Patriarch, passed September 6, 1985 in Beckley, West Virginia. Horace R. Lillard, Sr., center, with two of his sisters, Annie May Lillard, left, and Rosa Lillard, right, attending a social function. 4. Horace R. Lillard, Jr. Horace R. Lillard, Jr., born 1925 in Martin's Ferry, Ohio, was the son of Horace R. Lillard, Sr. and Aletha (Randall) Lillard. Horace R. Lillard, Jr. moved from Ohio, along with his father to Beckley, West Virginia where he studied music, like his father, and similarly mastered the reed instruments, particularly the tenor saxophone. Horace R. Lillard, Jr. enlisted in the U. S. Navy during WW II and served with distinction in the Pacific theatre. After returning from overseas, Lillard was stationed at the Norfolk Naval Station, and moved to Portsmouth, VA where he and his wife Rosetta had four sons, Horace Ronald Lillard, Kenneth E. Lillard, Calvin A. Lillard, and Carlton E. Lillard. Hoarce R. Lillard, Jr. retired as a U. S. Navy veteran. In addition, he worked at the Norfolk Naval Shipyard in Portsmouth, VA, and performed as a professional musician in the Hampton Roads, VA area. Horace R. Lillard, Jr. passed in 2008 in Portsmouth, VA.
Rev. Dr. Rosetta Catherine (Smith) Lillard, wife of Horace R. Lillard, Jr., was an inspirational leader, preacher, evangelist, and humanitarian. Rev. Dr. Rosetta Catherine (Smith) Lillard, dynamic orator, Co-Founder and Vice President of the Prayer Partners Radio Ministry Group, held two (2) doctorate degrees, and was a very popular religious broadcaster on radio stations WGPL and WPCE, Willis Broadcasting Network, in Hampton Roads, VA. Highly respected Matriarch of the Lillard Family, Rev. Dr. Rosetta Catherine Lillard passed in 2009 in Portsmouth, VA.
Mable Lillard, circa 1920, sister of Horace R. Lillard, Sr., and aunt of Horace R. Lillard, Jr., with whom he resided for a time, growing up, in Beckley, West Virginia. Mable Lillard would later manage the family store, Broadway Cash Grocery, in the East Park community of Beckley. Flossie Lillard Price, sister of Horace R. Lillard, Sr. and aunt of Horace R. Lillard, Jr. Flossie Lillard Price resided in Beckley, West Virginia. Horace R. Lillard, Jr., left, band leader and professional musician, playing the saxophone. Raised in Beckley, West Virginia, Horace R. Lillard, Jr. lived for a time in Columbus, Ohio, and Chicago, Illinois. After enlisting in the U. S. Navy during WW II, Lillard was stationed at the U. S. Naval Station, Norfolk, VA. He married Rosetta Catherine Smith of Portsmouth, VA and together they had four sons. Having served in the Pacific theater during the War, Horace R. Lillard, Jr. later retired from the United States Navy. He formed his own band and continued to perform music in the Hampton Roads, VA area for a number of years. Lillard also worked at the Norfolk Naval Shipyard in Portsmouth, VA. Horace R. Lillard, Jr. and his family resided in the Cavalier Manor community of Portsmouth, VA.
Newlyweds, Rosetta Catherine (Smith) Lillard, left, and Horace R. Lillard, Jr., right, in Chicago, Illinois, about 1948. They are the parents of four sons, Horace Ronald Lillard, Kenneth E. Lillard, Calvin A. Lillard, and Carlton E. Lillard. Horace Ronald Lillard, left, and Kenneth E. Lillard, right, 1952. Two of the four sons of Horace R. Lillard, Jr. and Rosetta Catherine (Smith) Lillard. Annie May Lillard, sister of Horace R. Lillard, Sr. and aunt of Horace R. Lillard, Jr. In the photo, Annie May Lillard, left rear; L. Farris Beard, husband, right rear; Leslie 'Brother' Beard, son, front left; Frances 'Sister' Beard, daughter, front right. Circa 1922. Hattie G. Farris, of Springfield, Ohio, cousin of Horace R. Lillard, Jr., was born February 16, 1915 in Chickamauga, Georgia. She was the daughter of Newton and Sovella (Lillard) Farris. Hattie G. Farris graduated from Wilberforce University, Wilberforce, Ohio with a B.S. degree in education. She retired from Wright Patterson Air Force Base, Dayton, Ohio. Hattie G. Farris passed February 2, 2010 at the age of 94. Mable Lillard Johnson, elder sister of Horace R. Lillard, Sr., and aunt of Horace R. Lillrd, Jr., was the Lillard Family Matriarch during the decades of the 1940's, 50's, 60's, and into the early 70's, following the passing of her mother Nina Mann Lillard. Mable Lillard married Will Johnson. After that marriage, she married Mr.Tuck, a very respectable gentleman, thereby becoming Mabel Johnson Tuck. For several decades, Mable Johnson Tuck was co-owner of the Broadway Cash Grocery in Beckley's East Park, and was a very active leader in many civic, cultural, and religious organizations and activities in Beckley, West Virginia. Her many activities and achievements (including being a church leader, a sponsor of musical education and events, a national and state officer in the female auxiliary of the Masons, as well as a Cub Scout Den Mother) were frequently featured in the pages of the Beckley Post-Herald, and Raleigh Register newspapers. Mable Johnson Tuck passed on October 15, 1972, at the age of 78, in Beckley, West Virginia.